Hardback, 8.5 x 6 in. / 192 pgs / 150 color. Bob Venturi and Denise Scott Brown said that architects need to learn from Las Vegas. We'd like to say at this time that Las Vegas needs to learn from the Mojave. In an era of scarcity, Vegas is a city that's known for excess, and I think it needs to pay attention how the environment of scarcity can actually be a stunningly beautiful one. Text by Nicole Huber, Ralph Stern. Flashing facades, garish casinos, and neon lights—isn't that our image of the gambling metropolis of Las Vegas? But what of the city that lies beyond The Strip? 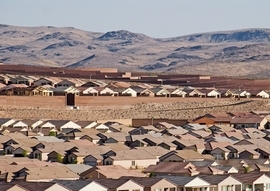 Urbanizing the Mojave Desert: Las Vegas shows us the unknown, desolate side of Las Vegas and its environs. There, where the suburbs in the desert encroach on nature and change it, the book reveals the surprising connections between the architecture that defines the image of Las Vegas and the natural, abstract geometries of the Mojave Desert. In Learning from Las Vegas Robert Venturi and Denise Scott-Brown focused on the glamor of the Las Vegas Strip, analyzing the city for its postmodernist qualities while ignoring the Mojave desert immediately beyond. Exploring the city at the same time as Venturi and Scott-Brown, the renowned architectural historian and critic Reyner Banham focused his attention on what he saw as the strikingly modernist spaces of the Mojave desert and disregarded the postmodernist lure of the Strip. 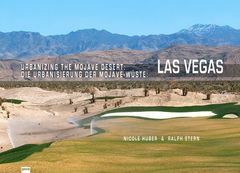 Urbanizing the Mojave Desert: Las Vegas takes a different tack, presenting Las Vegas as a hybrid landscape shaped and reshaped by practices of everyday urbanization as they have taken place upon this arid land. This perspective reframes the seamless surfaces of draped neon lights, curtain walls, and landscape features layered onto the Mojave?s stark topography, uncovering distinct strata that re-spatialize the social, cultural, and environmental implications of urbanizing a fierce yet fragile desert. Nicole Huber is an Associate Professor of Architecture at the University of Washington and a licensed architect in Germany. Ralph Stern is Dean of the Faculty of Architecture at the University of Manitoba. For those who live in Las Vegas, or study it, or both, this book is not merely vital. It is vitally necessary. … how rapid -- and rabid -- development has obscured and erased cultural and physical history. A must-read for anyone who calls [Las Vegas] home or for those who wonder about off-Strip life. Huber and Stern understand that future analyses of Las Vegas need to move beyond comparisons with Los Angeles and other southwestern cities such as Phoenix. ... The authors rightly enlarge the discussion by citing the work of cultural critic Ackbar Abbas, who contends that globalization domesticates what was once exotic and in this way makes the strange seem strangely familiar. 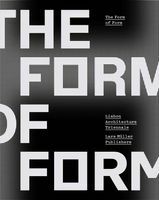 FORMAT: Hardback, 8.5 x 6 in. / 192 pgs / 150 color.